'Hungry eyes' is a rather unknown single by the British band Sniff 'n' the Tears. Core member of the band is Paul Roberts, who is also a noted painter. He is responsible for much of the band's singles, and it was the sleeve of this single more than anything else that made me buy this single. I liked the picture, and in fact I still do. The song, meanwhile, is not much to write home about. Maybe that's why it didn't chart in any territory. The genesis of 'Driver's seat' dates back to 1973 and a demo tape recorded for a French record label by singer/guitarist Paul Roberts for the band Ashes of Moon. However, that band broke up and, at the suggestion of drummer Luigi Salvoni, Roberts reformed it as Sniff 'n' the Tears with guitarists Laurence 'Loz' Netto and Nick Dyche and bassist Nick South. They shopped the demo tape and signed with the small Chiswick label in 1977. They recorded 'Driver's seat' in 1978 on their debut album 'Fickle heart'. According to Paul Roberts, 'Driver's seat' isn't about driving, but rather 'fragmented, conflicting thoughts and emotions that might follow the break-up of a relationship'. The single peaked at number 4 in the Dutch Top 40 in 1980, but resurfaced in 1992 when it was used in a Pioneer commercial, reaching number 1 on that occasion. 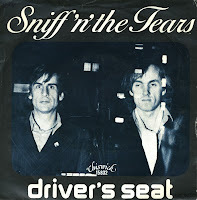 Sniff 'n' the Tears will always be remembered for their biggest hit, 'Driver's seat', one of the best songs to play if you're driving around in a car. Or so I've heard - I don't have a car. Which may be why I prefer this single, released three months earlier in August 1980. 'One love' comes from Sniff 'n' the Tears' 1980 album 'The game's up'. It reached number 34 in the Dutch Top 40.